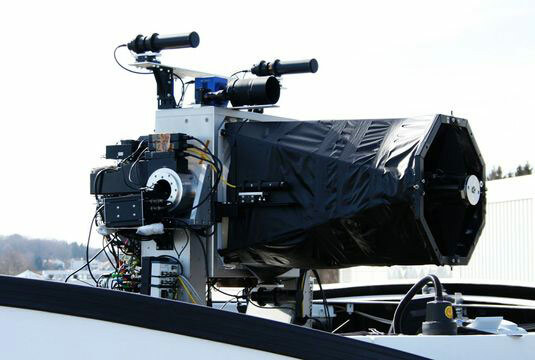 The ground-based telescope, with cameras and laser light sources for automatic precision positioning. To reduce the level of stray light, the normally open structure was lined with black fabric. Physicists from Ludwig Maximilian University of Munich have successfully transmitted a secure quantum code through the atmosphere from an aircraft to a ground station. This is the first time that quantum cryptography has been used for communication with a mobile transmitter and it demonstrates that quantum cryptography can be implemented as an extension to existing systems. Can worldwide communication ever be fully secure? Quantum physicists believe they can provide secret keys using quantum cryptography via satellite. Unlike communication based on classical bits, quantum cryptography employs the quantum states of single light quanta (photons) for the exchange of data. Heisenberg’s uncertainty principle limits the precision with which the position and momentum of a quantum particle can be determined simultaneously, but can also be exploited for secure information transfer. Like its classical counterpart, quantum cryptography requires a shared key with which the parties encode and decode messages. However, quantum mechanical phenomena guarantee the security of quantum key distribution. Because quantum states are fragile, interception of the key by an eavesdropper will alter the behavior properties of the particles, and thus becomes detectable. This encrypting strategy is already being used by some government agencies and banks. Data are sent either along glass-fiber cables or through the atmosphere. However, optical key distribution via these channels is limited to distances of less than 200 km, due to signal losses along the way. In 2007, LMU physicist Harald Weinfurter and his group successfully transmitted a key over 144 km of free space between ground stations on the islands of Tenerife and La Palma. Distribution of such keys via satellite networks would make secure data transmission possible on a global scale. A team led by Weinfurter and Sebastian Nauerth at the Physics Faculty at LMU Munich, in collaboration with the German Center for Aeronautics and Space Research (DLR), has now succeeded in optically transmitting quantum information between a ground station and a plane in flight. This is the first time that quantum cryptography has been used for communication with a mobile transmitter. The quantum channel was integrated into DLR’s laser-based, wireless communications system, allowing DLR’s expertise and experience with the system to be utilized in the realization of the experiment. “This demonstrates that quantum cryptography can be implemented as an extension to existing systems,” says LMU’s Sebastian Nauerth. In the experiment, single photons were sent from the aircraft to the receiver on the ground. The challenge was to ensure that the photons could be precisely directed at the telescope on the ground in spite of the impact of mechanical vibrations and air turbulence. “With the aid of rapidly movable mirrors, a targeting precision of less than 3 m over a distance of 20 km was achieved,” reports Florian Moll, project leader at the DLR’s Institute for Communication and Navigation. With this level of accuracy, William Tell could have hit the apple on his son’s head even from a distance of 500 m.
With respect to the rate of signal loss and the effects of air turbulence, the conditions encountered during the experiment were comparable to those expected for transmission via satellite. The same holds for the angular velocity of the aircraft. The success of the experiment therefore represents an important step towards secure satellite-based global communication. 3 Comments on "Physicists Successfully Transmit Quantum Code Through the Atmosphere"
is a bit like star wars. Groundbreaking! I was surprised to discover that one of the properties of quantum particles is being used in cryptography! It is especially exciting to me that if it is intercepted (viewed), the information itself changes! This means big things for privacy and I wouldn’t look at this being publicly available for a long time. That sort of power in the hands of citizens really scares the powers that be. They will find a way to thwart the information being changed merely by viewing it. For the same reason the message was originally constructed in one way, they will simply reconstruct a new message to look anD act the same exact way that the message the was as they received it. Any signal that can be received and interpreted can be recreated and rebroadcast. Just a question fo budget, time, and how bad you need to do this.